On Saturday the 10th December Ballycastle gets into the festive spirit with its first ever “Ballycastle Christmas experience”. This celebration of the spirit of Christmas will be held in the stunning setting of “The Shambles” from 5pm-7pm. This Christmas experience will feature Santa and Mrs Claus in their grotto, and the elves busy at work in their workshop ahead of the big day. There will also be a living crib with real animals there on the evening with live music and other entertainment also being provided. The very best of festive food and drink will also be on offer for all the family to enjoy. 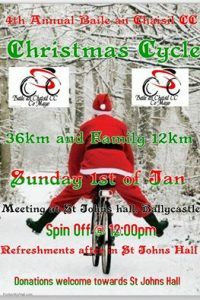 2016 sees the 4th renewal of the Baile an Chaisil Christmas cycle taking place on January 1st at 12 noon. This years event has a 36 km route and a 12 km family cycle, with both starting from St John’s Hall. Refreshments will be available afterwards in the hall. The chosen charity this year is St John’s Church. All donations are most welcome.